Founded in 1962, Wings of Hope serves more than 1,000,000 people yearly at over 150 bases in the U.S. and in more than 40 countries. Wings of Hope is a non-sectarian, non-political, non-racial, international Humanitarian organization working to bring self-sufficiency to people in need. Thanks to Mr. J. W. Engel of Handel-Jij Noviol BV (Netherlands) for sponsoring the oil needs of the Red Rockette during her European journeys. His assistance is very much appreciated. 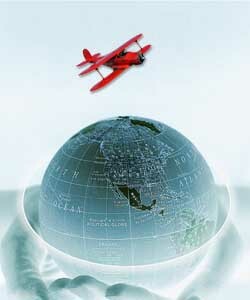 See the Phillips Aviation fuel/oil link at www.kendall.nl. Seems that it was just yesterday that Christmas was spent in Hong Kong, Singapore, Tokyo, Frankfurt, Milan, Rome, Auckland, Sydney, Newark, South Bend or some other exotic? place like that. That part of a 60 year career in Aviation has passed. The current "Vintage" edition of that career is still in motion. The Red Rockette winters in Latvia this year where I shall return in the springtime to resume "Wandering the World in search of the Perfect Blueberry Muffin". It's a quest worth pursuing. The Red Rockette wins the Freddie March Spirit of Aviation, September 12, 2012. Latest Blog post: "Ukraine summer fly-in" - 3/18/13. Location pinpointed on the world map by the Track Plus system. and Great Circle Mapper Copyright © Karl L. Swartz. My story really began when I was eight years old. I had been smitten by the Staggerwing type. I was 58 years old before I could afford one—only a moderate 50 year wait. "I walked into an open hangar the other day, alongside all the modern, shiny, all-metal jobs there was a Staggerwing. She is a rare site. When you see one, you know you are in the presence of one of the great ones. We all know she has no soul—she is an inanimate object made of steel, plywood and spruce. But in the dark, silent, hangar, surrounded by tricycle landing gears and sleek aluminum, the Staggerwing sits in profound majestic grace. For an instant, you are part of the past—you hear her low pitched, rumbling Wasp engine, you see her wingtips trembling in the gray light of an early dawn. She is a Queen, ruling quietly over her domain and like all royalty, she has no need to speak to prove her claim to the throne—it is a fact accepted by all who see her. People walking through the hangar idly glance at the other aeroplanes, but when they pass the Staggerwing, they stop. And their eyes go slowly over her—from the big radial cowling to the rapidly tapering fuselage, to the rounded fin and rudder, then back to the negatively staggered wings with their graceful struts, their steel brace wires, and their elliptical tips. They walk around her slowly and one asks, what is it? The other replies, I have never seen one before. They speak in hushed tones, as one does in the presence of a Queen. They stay one minute of perhaps five, then they leave, walking slowly. Outside the hangar, in the sunlight, they turn for one last look, their faces serious and filled with awe. They have been int he presence of one of the great ones". 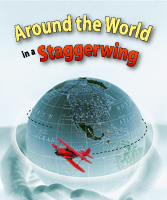 And so my adventure began—Flying around the world in Staggerwing. The aircraft was purchased late in my flying career. The aircraft was well worn when I purchased it and I knew I had to either fly it until it was worn out, then trade it or rebuild it. I did fly it for a few years until restoration was finally necessary. I chose to rebuild this machine for several reasons. I had been traveling to New Zealand for a number of years and had the good fortune to meet many fine aviators in the vintage airplane movement during those visits. I had taken part in several vintage aircraft events there and time and again had seen the workmanship of a small company, the Croydon Aircraft Company, of Mandeville, NZ (near Gore), way down near the bottom of the South Island. They had never worked on a Staggerwing before but I made the decision to let them have a go at restoring their first Beechcraft product. Maybe others would come to them after this one. The restoration is now complete after 3 years of final test flying and modifications. An extra year of delay was incurred due to the poor judgement used by an American engine restoration company during the Pratt & Whitney R-985 engine restoration process. The engine had been restored in the US prior to shipping the entire aircraft to NZ for airframe restoration. Without going into detail, the engine required a good deal of disassembly and restoration of work that had been poorly completed in the first place. This work was completed in NZ without compensation from the original engine remanufacturer. More test flying after the engine work was completed proved that the engine was now ready for long range flying. Finally, on 9 April, 2009, after being in NZ for 8 years, she was ready to begin the long journey home . . . westbound . . . the long way 'round. Continue the Journey with Captain Biff on 'Journaling the Journey'.